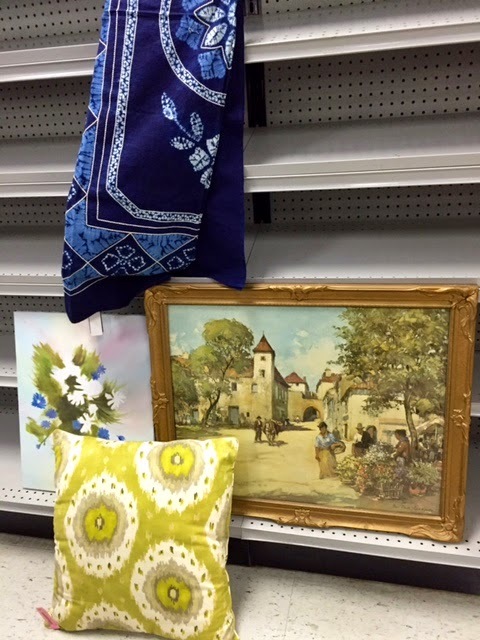 Do you get overwhelmed or underwhelmed when you stop in a thrift store? 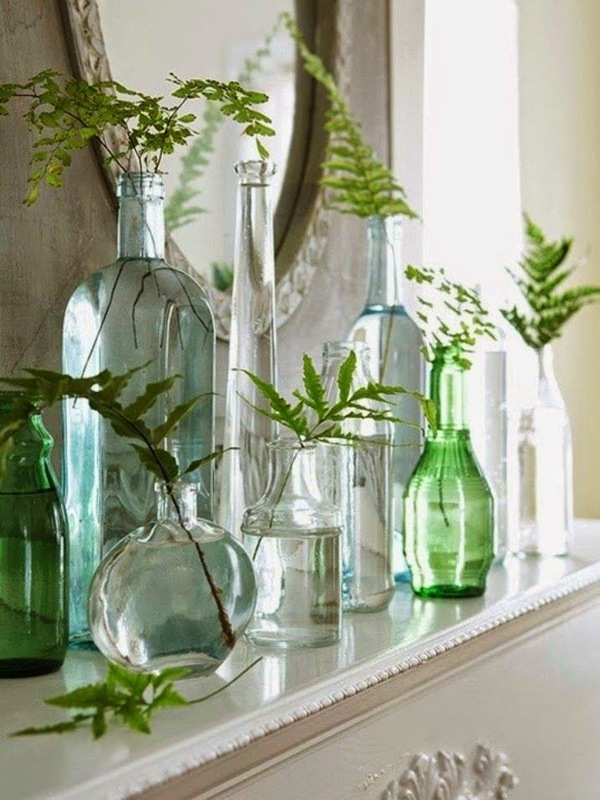 to incorporate it into your decor. 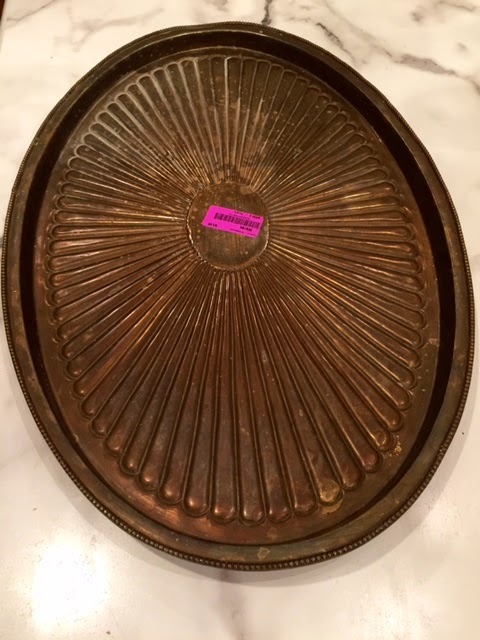 AND hidden under the turkey roaster was this brass tray 15" x 23" - $3.99. I'm not finished with it yet, but it's cleaning up nicely with Bar Keepers cleaner. in your bathroom or just laid on top of a pile of books - 99 cents! sprig of greenery. It's simple to put together a unique collection - .99 cents each. crane back there looks interesting? 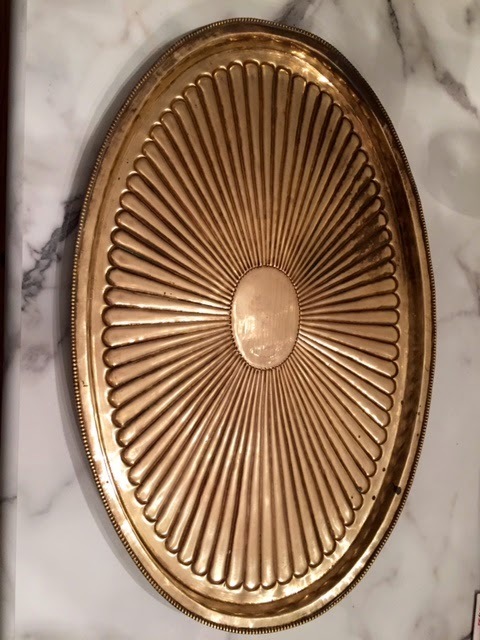 and the brass tray. Oh, and wouldn't this media cabinet make a great bar! just propped a few things up to give you an idea. Another ho-hum collection, or is it? finds and how I'll be using them for myself and clients! Hope you're inspired to poke around your local store. Great post! It takes a creative eye to weed through the stuff at thrift stores and find the gems. This is a great tutorial to show people the potential that is there! I was wondering which Goodwill you found all the items at? The two that are near me at Simms/Belleview and Pierce/Coalmine usually don't have that nice of things that cheap. You'd better watch out, that thrift store's going to try to hire you to create their displays!! Your thrifting posts are always SO inspiring!! Makes me want to head to my local thrift shops ASAP. 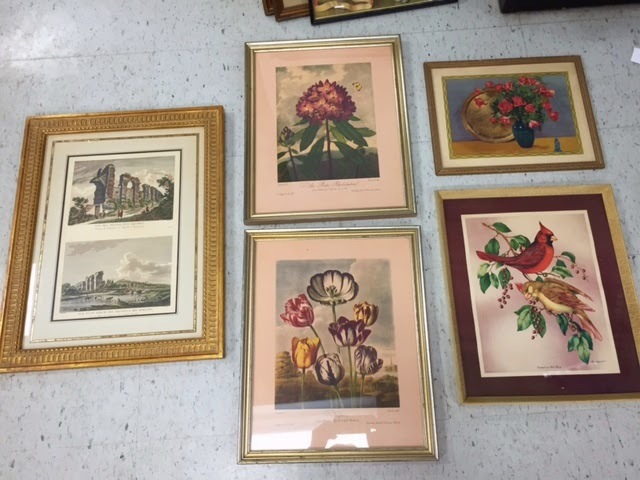 Can't wait to see what you ended up bringing home - I loved that big frame, tray and the little vases. Hi Jody - I was at the Wadsworth & Florida location. Have fun! I love to thrift!! Can't wait to see what came home with you Pam! Such pretty finds, Pam. The tray is beautiful. I think with your styling skills, you could make a tub of butter look stylish! Great post. I love to sniff around thrift stores to see what gems I can find. Ooooh I love posts like this! I would give anything to go thrift store hunting with you and see you in action!!! I can only see what I'm in the market for....you have such a great eye and see the potential in so many cast offs - I love your gift! Love it! I haven't had a good thrifting day in a while. However, I just discovered that they're putting in a new Goodwill a mile away... Yippee! I might be in trouble. There really aren't any thrift stores close to me, I have to go across town, so I'm excited! Looks like you have a great GW....mine not so great...wonder how many things actually make it to the shelves...Looking forward to your great finds...you always spot those diamonds among the stones! Clearly, your Craigslist and Thrifting options are a cut above what's available in my area! Unfortunately, most of the thrift stores in my area have jacked up the prices comparable to an antique store or boutique. Actually my best finds now are coming from booths at antique malls that are having a sale or going out of business! You have such a good eye, Pam! I love what you found!! Yikes! Just when I am trying to control my addiction to thrift shopping, you have a fabulous post like this. I like that painting you found - good size, good frame, good price - what's not to love? You are my thrift store/Craigslist idol and I love that you share your creative eye. Your clients are lucky to have you. 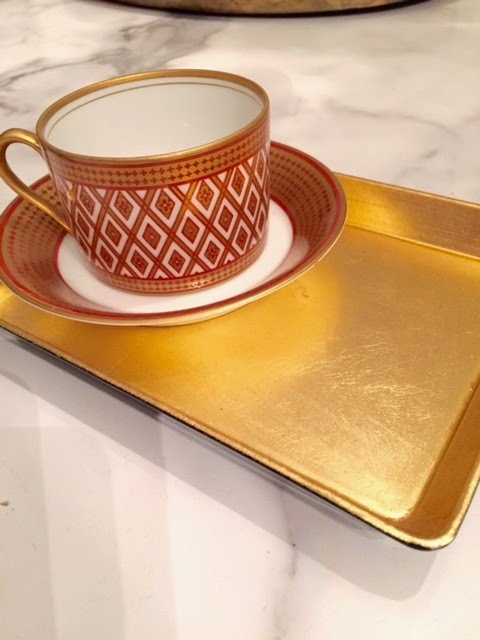 I love that tray! We have a decent Goodwill near our home, so I stop by there occasionally. I also like to use little vessels and decanters as bud vases. Great post, Pam! 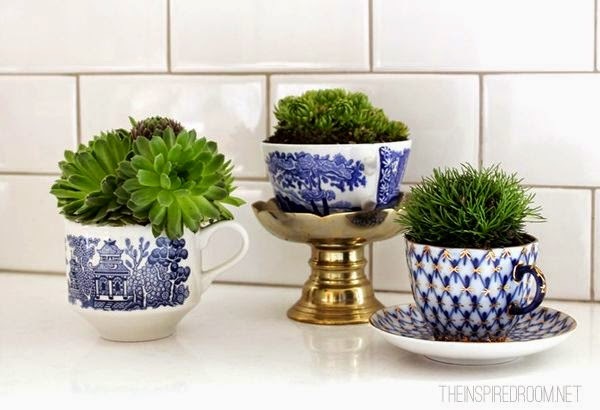 I love the cobalt blue plate! You're right, would be beautiful on a vanity or beside table for jewelry!! Dang, you found some pretty killer finds amongst all that junk! I'm especially drooling over that tablecloth! Well how fun was this!? I love shopping the thrift stores, you just never know what you will find! WOW! And I love that blue plate! Oh my! I am terrible at seeing the potential at thrift stores. It usually just overwhelms me. But I like the tips you have given here to see the unique things in a different way like the vases and the black and gold tray. I'll keep them in mind the next time I go thrifting! Your post makes me want to go thrifting again today! :) But I need to look with a trained eye...so that I can see the possibilities like you do. I have to ask: Where are your favorite places to thrift in Denver?? I live here, and am always looking for new thrift stores as I feel like I sometimes fall into a rut...!